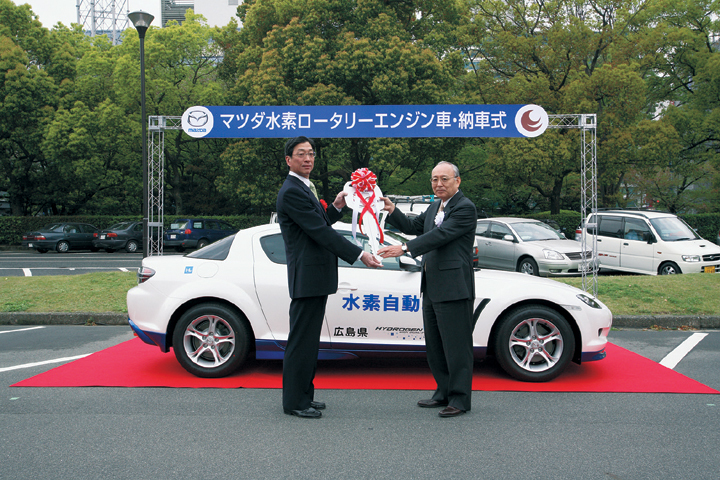 HIROSHIMA, Japan - April 21, 2006: The government authorities of the City of Hiroshima and Hiroshima Prefecture, situated in western Japan, have each had one dual-fueled RX-8 Hydrogen RE vehicle delivered from Mazda Motor Corporation. Leases for the rotary engine RX-8 Hydrogen RE cars commenced at a ceremony held today to mark the deliveries and was attended by local dignitaries. 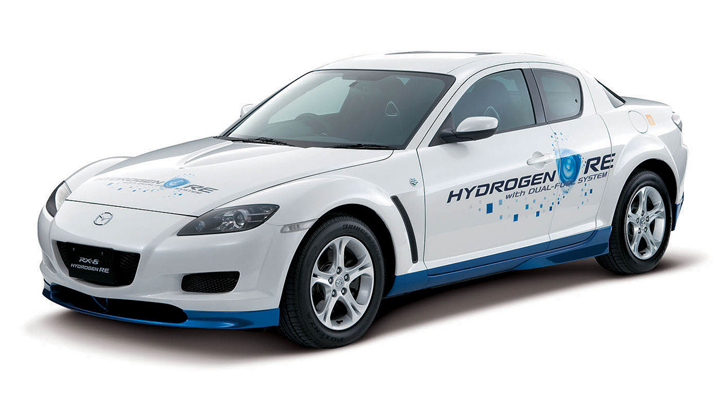 The RX-8 Hydrogen RE model features a dual-fuel system that allows the driver to select either gasoline or hydrogen fuel with the flick of a switch. Mazda delivered a hydrogen vehicle each to its first two corporate customers, Idemitsu Kosan Company and Iwatani international Corporation, in March 2006. With the additional leasing to these local government authorities, Mazda has made fleet sales of four hydrogen RE vehicles to date. Future plans call for leasing up to ten vehicles with other fleet customers, including local governments and energy companies, by the end of 2006. As Mazda forges ahead in its efforts toward achieving a more environmentally friendly society, the Hiroshima-based company will continue its independent development of rotary engine-powered hydrogen vehicles. In October 2004, Japan's Ministry of Land, Infrastructure and Transport approved Hydrogen RE for real-world public roads tests and commercial leasing started in February 2006. Kazuhide Watanabe, Mazda's chairman of the board, said, "We are very pleased that the City of Hiroshima and Hiroshima Prefecture endorsed Mazda's concept of hydrogen vehicles by becoming our fleet customers so quickly after vehicle leasing started. We're proud to be based in Hiroshima, and Mazda will continue with its initiatives to help achieve a cleaner hydrogen society in the future."